Kirk Milette moved to Laguna Beach when he was 12, self motivated he thrived in the progressive Laguna Beach school system. In his sophomore year he selected a jewelry making class. Learning some of the basic techniques of creating jewelry. 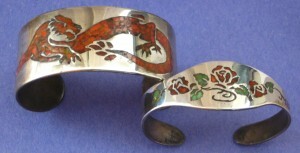 Kirk refined his sketches and designed several original pieces over the next few years, encouraged after entering school competitions wining first and third places, Kirk continued designing jewelry after his schooling. While working in a friends studio Kirk made several pieces of jewelry, sold them and in 1976 started Kirk Milette Jewelry for a professional career. Customers would order specific designs or select something from Kirk’s finished pieces. 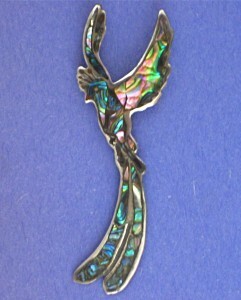 For the first couple years Kirk made one of a kind fabricated jewelry pieces and specialized in inlay pieces created by hand cutting sterling silver sheet with intricate flowers, humming birds or horses and other fantasy designs, inlaying them with coral, malachite, turquoise, jet and abalone shell. Mentored by a couple local jewelers (Nora Pierson and Russ Hind), Kirk was encouraged to pursue lost wax casting. Pulling from skills learned over the years (he started carving soap at the age of 7), Kirk carved and built several wax original designs for his jewelry. Kirk was introduced to one of Cini Jewelry’s master bench jewelers, Felipe Mendoza, who had been making jewelry since 1949. Seeing an opportunity to expand his knowledge and create a jewelry line with his original designs, Kirk secluded himself for several months on a ranch in central Idaho, undistracted he dedicated hundreds of hours to develop 30 to 40 new original designs. Returning to Laguna Beach with specific goals of producing and selling his new creations. Kirk apprenticed with Felipe over the next several years, learning ‘old school’ techniques of: Casting, Soldering techniques, Filing, Polishing, Stone Setting and Jewelry Repair. In 1979 Kirk worked with many individuals creating wedding rings, engagement rings, pendants, ear rings and bracelets. Kirk expanded his exposuer, working with a couple dozen shops, galleries and companies in the Western United States. Selling his designs and offering to develop Logos or filling special orders. Using his personal design process and hands on approach while developing these originals, Kirk Milette’s clients would work directly with him on the designs, which gave each the desired size, shape and distinct look to the finished pieces. In 1982 Kirk showed at The Sawdust Art Festival for the first time, and continues to participate at the Laguna Beach art show every summer. The Sawdust Art Festival is a great place to see clients and meet new customers. It is located in a unique out door setting, of mature eucalyptus grove with about 200 local Laguna Beach artists and crafts people showing their hand crafted wares. In whimsical temporary booths they build each summer from the ground up. The show runs every day and evening for two months, July and August. During those months his shop on South Coast Highway is only open by appointment. 1990 Kirk Milette designed and copyrighted ‘The Original Harmonic World’ a small silver or gold musical world, with raised continents and when shaken produces a soft chiming sound. He licensed a manufacture to produce the bulk of the volume for this iconic design. These were very well received and quickly became a best seller in many stores. Kirk hand detailed and produced a numbered limited edition for The Sawdust Art Festival between 1990 and 1994. Over the decades of experience Kirk has created many groups and themes within his jewelry line. In the display of hand made charms, pendants, rings, bracelets and ear rings being produced in sterling silver and 14K gold you will find Hidden Treasures and other surprisingly unique and affordable jewelry gifts. There is a selection of originals in 14K, 18K yellow or white gold and a few in platinum too. There are rare collectable gemstones and exotic pearls in finely crafted one of a kind pieces, many of these gemstones and natural pearls, were found or mined 30 to 50 years ago. You can see the complete display of what is available now by contacting his store. The selection will change since the pieces are hand produced. His unique and extensive collection may help stimulate inspiration for a custom design or you may find the perfect piece waiting for you already finished.